This week marks the bicentennial of the pivotal Battle of Waterloo, where Napoleon’s troops were defeated by combined troops from Great Britain and Prussia. In the stories of the Canon, there are numerous references to Waterloo Bridge and Waterloo Station, both commemorating the battle victory. In addition, Doyle’s other creation of Brigadier Gerard participated in the battle during the two-part How the Brigadier Bore Himself at Waterloo. At the top of this post is the 2015 version of Benedetto Pistrucci’s Waterloo medal. Pistrucci is best known for his design of St. George slaying the dragon that has been used on the British gold sovereigns. The original design of the Waterloo medal began in 1817 and the medal was finally struck in 1850 due to internal politics, salary disputes, personality conflicts and the complexity of the actual design. By the time the medal was struck, only the Duke of Wellington remained of the intended recipients of the medal. 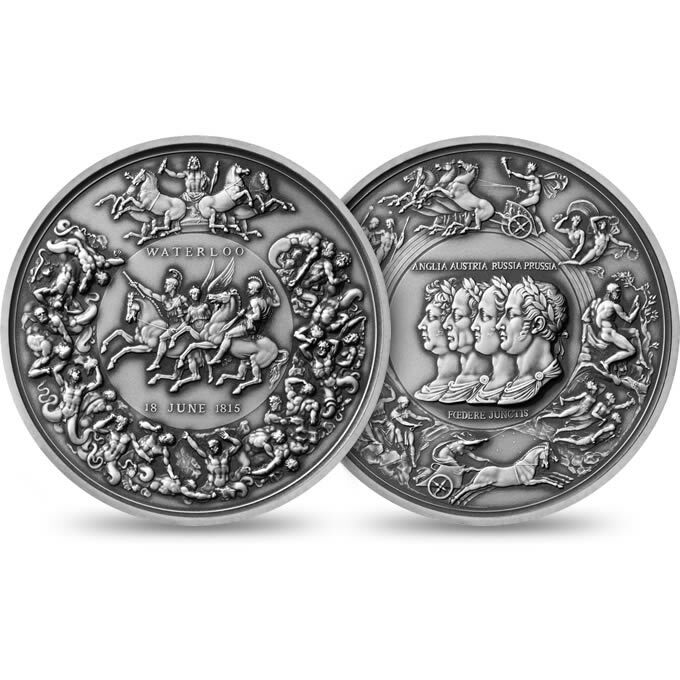 The 2015 version of the silver medal is 80mm wide and weighs 250g (the original 1850 medal comes in at 140.8mm and 677g) and has a mintage of 1,815 pieces. Two centuries on and the Battle of Waterloo still captivates. Full-blooded characters, tactical manoeuvres and a legacy – the Waterloo Medal – are all remembered with this striking £5 coin, among the first to bear the new portrait of Her Majesty The Queen. David Lawrence has captured the accord between Wellington and Blücher, pivotal to the victory in his coin, a treasure for collectors and those who wish to explore a decisive battle in British, European and world history. Napoleon Bonaparte and the Duke of Wellington, closely-matched enemies both fighting for their national interest – Napoleon to build a European Empire and Wellington to protect that of Britain. But these aren’t the only characters involved in the Battle of Waterloo; the commanders’ allies shared their zeal, making the battle a closely fought contest of strategy and strength that ultimately brought Napoleon’s exploits in Europe to a close. The mighty double-thickness sterling silver Piedfort is a fitting tribute to this important anniversary. Its impressive edge is inscribed with the words ‘THE NEAREST RUN THING YOU EVER SAW’ recalling Wellington’s own description of the battle, still respectful to his enemy Napoleon even in victory. This very special and very limited commemorative release is accompanied by a numbered Certificate of Authenticity and fascinating booklet on the battle. The booklet will delight collectors as it also reveals how The Royal Mint was involved in honouring those who fought in the battle with the Waterloo Medal and in the restoration of the coinage to its former glory. The Battle of Waterloo has great historical importance. It has captured our interest for two centuries for its fascinating characters, the bold tactics employed by Wellington and Napoleon and the legacy that the battle left behind. The men who fought in the battle received the Waterloo Medal – the first campaign medal and this tradition is still honoured across the world by military forces today. As long as conflict is inevitable those who make the ultimate sacrifice for their country will be recognised. Now the bicentenary of this pivotal battle in world history is marked with a grand £5 coin that has a striking design by artist David Lawrence. Your coin is accompanied by a numbered Certificate of Authenticity and an absorbing booklet that reveals details of the battle, its leaders and the implications for The Royal Mint. Struck in a variety of editions, from Brilliant Uncirculated to precious metal Proof versions, there is an option to suit most budgets. 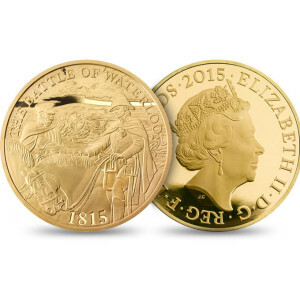 The Waterloo medal and the 4 Waterloo coins can be ordered from the British Royal Mint. The Battle of Waterloo took place in what is known today as Belgium, but at the time of the battle, Belgium was part of the Netherlands. The modern state of Netherlands has issued a series of 2015 coins – an uncirculated silver-plated copper €5 coin, a proof .925 fine silver €5 coin and a proof .900 fine gold €10 coin – commemorating the great battle. 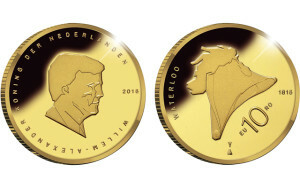 The obverse portrays Netherlands’ King Willem-Alexander, while the reverse design is based on the headdress, a bicorn (a two-cornered hat that was typical in military attire of the period) of the Prince of Orange (who would go on to become the Dutch King Willem II). Belgium had originally planned to issue a circulating €2 coin that would have been accepted in all countries of the European Union. France objected after 175,000 of the coins had been struck prior to its release and the coins wound up being melted. 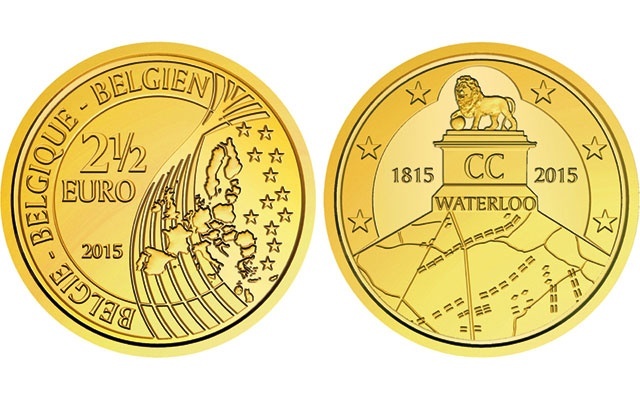 Belgium then decided to issue a non-circulating €2.50 coin, with the same design, that would only be legal tender within the country. More information about this squabble can be had in this BBC News report. Belgium has also released this .925 silver 10€ coin as well. 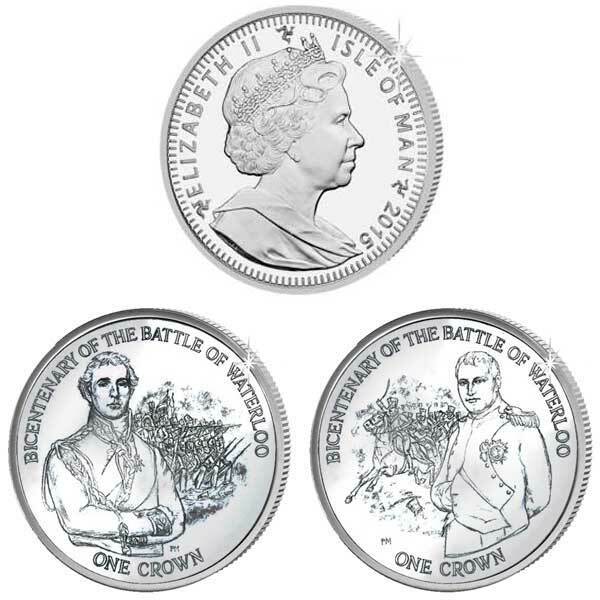 The Pobjoy Mint has issued Crowns featuring the Duke of Wellington and Napoleon for the Isle of Man. 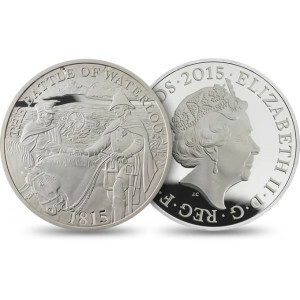 Both designs are available in an uncirculated cupro-nickel version and in proof sterling silver. 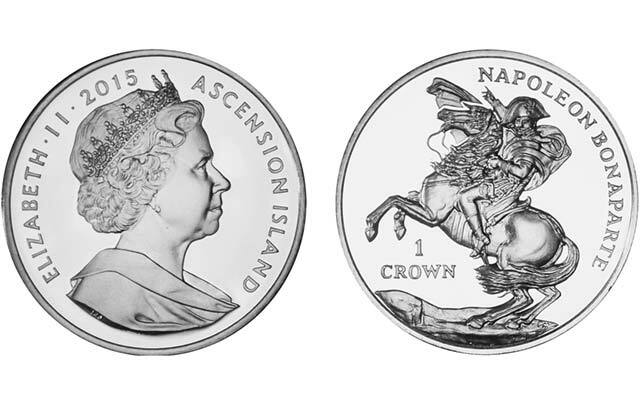 The Pobjoy Mint has also issued Crowns featuring a well-known portrait of Napoleon for the Ascension Island. Proof specimens are available in both .999 silver and .9999 gold. It’s interesting to note that in October 1815, Napoleon was exiled to the remote, British-held island of St. Helena (which at the time was part of the British Overseas Territory that included Ascension Island). As we mentioned earlier, there are many references to Waterloo Bridge and Waterloo Station throughout the Canon. The battle itself is mentioned in conversation between Holmes and Watson in The Adventure of The Abbey Grange. 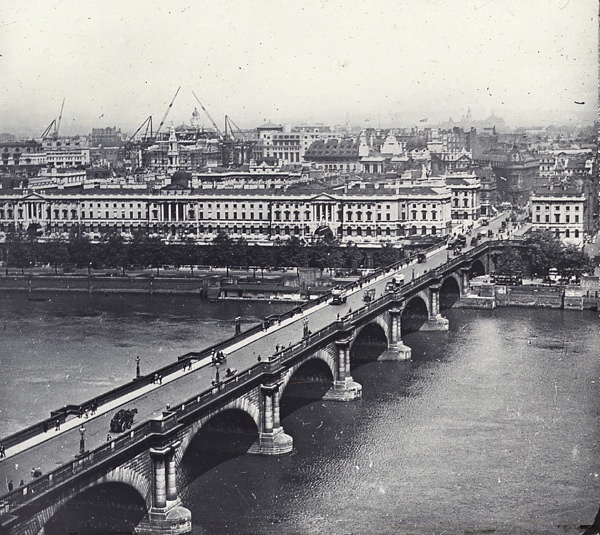 Waterloo Bridge references can be found in A Study In Scarlet, The Adventure of The Five Orange Pips, The Man With The Twisted Lip, and The Adventure of The Three Garridebs. 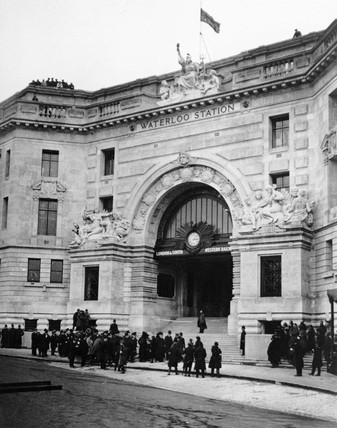 Waterloo Station references can be found in The Adventure of The Five Orange Pips, The Adventure of The Speckled Band, The Adventure of The Crooked Man, The Adventure of The Naval Treaty, The Hound of The Baskervilles, and The Adventure of The Solitary Cyclist.